IOC Welcomes Qatar Olympic Bid, Despite World Cup Scandal : The Two-Way Organizers of Qatar's World Cup bid were accused of paying bribes to FIFA. But the Olympic Committee said its process is transparent and they're not worried about corruption. A Qatari woman walks in front of the city skyline in Doha, Qatar. 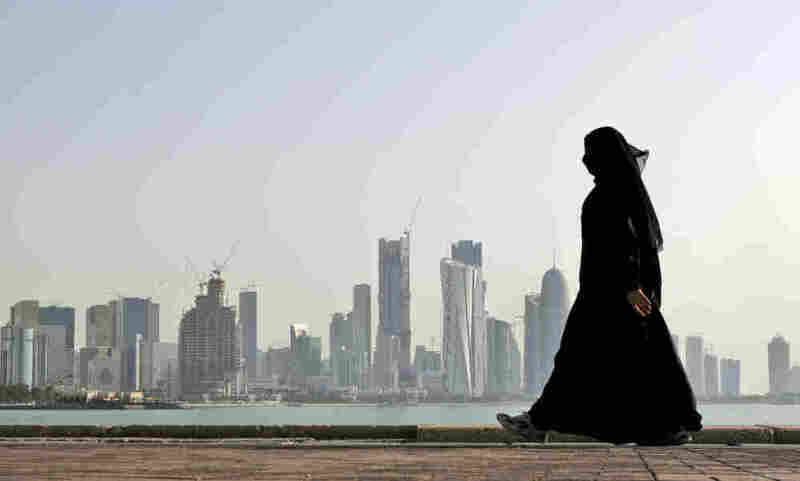 The news Friday that Doha, Qatar, is among six cities in the Middle-East, Asia and Europe bidding for the 2020 Summer Olympics comes on the heels of a scandal involving the desert kingdom's successful bid for the 2022 soccer World Cup. Organizers of Qatar's World Cup bid were accused of paying bribes to voting members of the governing body of the sport, known as FIFA. The chief accuser, a media aide involved in the 2022 effort, later recanted her accusations. But there were also allegations that Qatar's biggest cheerleader for the World Cup bid had offered bribes to FIFA members during his recent campaign to become FIFA President. A FIFA investigation concluded that Mohamed bin Hammam, the 62-year-old president of the Asian Football Conference, had offered $40,000 in cash payments in exchange for votes. Bin Hammam steadfastly maintained his innocence but FIFA banned him from the world soccer body for life. The International Olympic Committee had its own bidding scandal in 1998, in which the group seeking the 2002 Winter Olympics for Salt Lake City had provided cash, college scholarships, rent payments, lavish gifts and other inducements to IOC members. Ten were expelled and ten others faced sanctions. The U.S. Congress and Justice Department launched investigations as the IOC went through its worst ethics scandal ever. So, how does the IOC feel about an Olympic bid involving Qatar given a major bidding scandal involving one of the nation's major sports leaders? "Qatar has had a highly professional approach of the bidding process and we are happy that they are part of the 2020 competition," writes IOC spokeswoman Emmanuelle Moreau in an email to NPR. "We commend the [Qatar National Olympic Committee] for its professionalism and the exemplary manner with which they handled the process so far." No Middle Eastern country has staged the Olympics and the IOC has shown strong interest in taking the Olympics to regions that have never hosted them before. In fact, Qatar sought and received advance IOC permission to propose holding the 2020 Olympics in September and October so athletes are not forced to compete in mid-summer temperatures of 100 degrees and above. Summer games are typically scheduled in July and August. Qatar's bid for the 2016 Olympics was rejected outright by the IOC because October was the proposed month for competition. Moreau acknowledged the IOC's general concern about corruption but expressed confidence in restrictive bidding rules established after the Salt Lake City scandal. "The IOC has proved and continues to prove that it has a strong, transparent, tried and tested bidding process," Moreau writes. "We are not naive but have put in place all the necessary mechanisms to ensure a fair competition." Rome, Tokyo, Madrid, Istanbul and Baku, Azerbaijan, are also bidding for the 2020 Olympics. The U.S. Olympic Committee announced last month that no American city would bid. The IOC will select the 2020 host city in September, 2013.